White Collar Criminal Defense – Arleo & Donohue, LLC. Arleo & Donohue is highly skilled in defending individuals and corporations facing white collar charges. We have successfully represented prominent public officials, lawyers, doctors, corporate officers and directors, law enforcement officers, and licensed professionals accused of white collar offenses in federal and state court. We also represent these clients in Professional Disciplinary and Ethics Matters before various licensing boards and regulatory agencies. White collar cases can be exceptionally complicated. Authorities often spend years building these cases, which can encompass broad and diverse conduct. We recognize that each case is unique, demanding a defense tailored to fit each client and the circumstances of each offense. We are sensitive to the overwhelming nature of a criminal investigation and we endeavor to minimize any resulting disruption in our clients’ day to day lives throughout this process. Our firm has developed a model of practice through which we form a team with our clients in order to provide the most thorough representation and ensure that our clients understand what is occurring at every phase of the criminal proceedings. 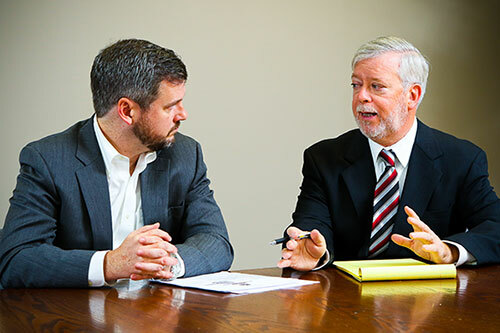 Our clients are prepared to handle any and every issue that may arise during the case. We appreciate the hard work involved in building a career and a professional reputation, and it is our goal to protect our clients’ reputations by employing creative and proactive strategies. You should contact our office at the first indication of a criminal investigation, as we strive to defeat potential charges before a case attracts media attention. The earlier you retain the experienced attorneys at our firm, the sooner we can begin to develop a strategic resolution in your case. In doing so, our firm utilizes its expert knowledge of substantive criminal law and extensive relationships with law enforcement to best serve our clients.